It's hard to believe, given the orthodoxy of their subsequent products, but in the early 1990s, deep within the Ford organisation, designers were challenging automotive engineering orthodoxies with some vigour. 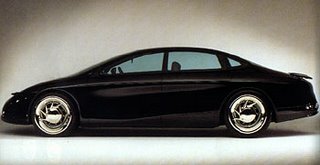 At the 1991 Detroit Motor Show, Ford showed the Contour, a radical prototype featuring an aluminium spaceframe, four wheel drive and a transverse 3.4 litre straight eight. The powertrain concept, titled T-drive, featured power taken from the middle bearing of the crankshaft by spiral bevel gears to a longitudinal gearbox which offered the options of front, rear or four wheel drive. Great claims were made for the layout's advantages for space utilisation, weight reduction and manufacturing flexibility, but even 5ivegears could spot a few flaws. Taking power round 90 degree bends more often than is entirely necessary is never a good idea, and the designers admitted that more engine capacity could only be achieved with fewer cylinders. They had six in mind, but surely a straight seven would have been the icing on a very strange cake. With the benefit of fifteen years of hindsight, I am not too surprised that nothing in the least like the Contour or T-Drive ever appeared in a production Ford in the years that followed.